High Roller Casino - £1 Wager-Free on Dream Catcher + 50 Spins! The online casino industry has been characterised by innovation throughout its history, and one of the most intriguing recent developments is the extent to which the world of social media and the casino world are being brought together by a handful of innovative casino operators. One of those names is Highroller, a site that was set up in 2017. 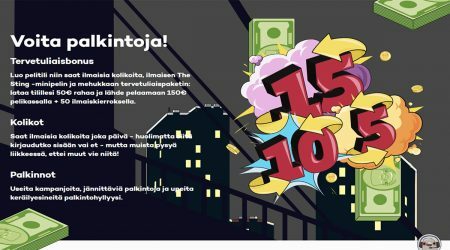 Owned by GIG (Gaming Innovation Group), which has plenty of experience in online gaming through operating other sites such as Kaboo and Rizk, Highroller is an innovative blend of all the most popular modern online casino trends, combining gaming, social media, and a modern take on the traditional casino atmosphere. As you would expect, it is geared up to be fully playable on all mobile devices. In this review, we will be taking a closer look at Highroller, examining the most important features of the site, from its bonus offerings to the quality of its customer service so that you can make an informed choice about joining and playing on the site. No online casino can afford to overlook the importance of bonuses in attracting new customers. The casino industry is full of sites offering a variety of bonuses to draw in players, but these offers are not all equally attractive. As a new operator in the market, Highroller has clearly paid attention to what online casino gamers want and provides a generous welcome bonus, depending on your location, along with free spins and an innovative loyalty scheme. The welcome bonus is the centrepiece of any site’s bonus deal, and the Highroller welcome bonus doesn’t fall short of this. New players will get £1 wager-free on Dream Catcher + 50 spins + 20 coins (which can be used in slot fights at the casino). You’ll get the wager-free £1 as soon as you make your first deposit and then you’ll get 10 spins on selected games every day for the following 5 days. Pretty neat! The £1 is wager free, so obviously it comes with no requirements. However, the 50 spins come with a wagering requirement of 35x which must be completed within 30 days. The minimum deposit amount is £20. In line with the site’s innovative approach to gaming, Highroller offers a range of cutting-edge regular promotions that are mostly aimed at loyal players and visitors to the site. 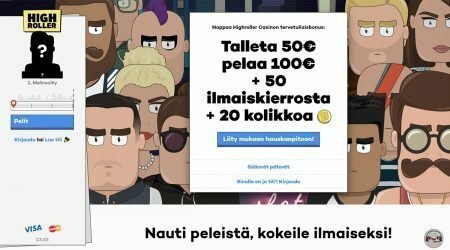 Whereas many sites run their VIP and loyalty schemes using points, Highroller has taken a different approach, offering a “second currency” in the shape of virtual coins. New users are given 20 coins when they join the site, and then every game that they play earns them more coins. Users also get a coin allowance for every day that they are on the site. The site offers games through which you can progress to earn more coins, and these coins can be used to buy a range of rewards from the Highroller shop, including free spins and other goodies. Best of all, if you use your coins to buy free spins, then no wagering requirements will apply. When it comes to looking after regular players, few sites do it better than Highroller. Game choice is a major factor in picking a casino, and this is one area in which Highroller outperforms most of its rivals. The site provides a huge selection of slots titles from some of the biggest names in the business. In fact, the list of developers that Highroller uses is a virtual who’s who of the online casino software world, and includes NetEnt, Microgaming, Quickspin, Yggdrasil, Evolution, Big Time Gaming, NextGen, Elk Studios, Thunderkick, Red Tiger, Push and Play’n GO – so whatever your favourite slots title, you are sure to find it on the Highroller site. The site also ticks all the boxes when it comes to table games, with an impressive selection of popular classics, including a healthy variety of roulette, blackjack and poker games, and a live casino option complete with friendly, professional dealers for players who want that real-world casino feel. Mobile players are also well-catered for. 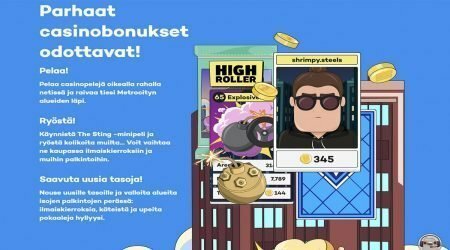 Unlike some sites that don’t offer many games for mobile play, Highroller makes more than 500 games from its extensive catalogue available for mobile users, and the site is fully tailored for mobile use, offering a smooth performance whatever your operating system or device, enabling you to play on the go with ease. The site’s focus on social media and social interaction also incorporates regular contests and tournaments for users, which is a great way to challenge your friends and enjoy casino gaming as a social rather than an individual activity. Many of the games on the Highroller site can be played for free, or even without an account, which is perfect for newcomers. Overall, Highroller’s gaming section cannot be faulted, and there is something for everyone here. The online payment industry is increasingly diverse, and this means that casinos have to respond by offering flexible deposit and withdrawal methods for all customers. Highroller has gone the extra mile in this regard and has reached arrangements with a number of payment providers. Players can fund their casino accounts using an impressive array of different methods, including Visa, Mastercard, Maestro, paysafecard, Trustly, Neteller, Zimpler, Skrill, Euteller and Ukash. There is a minimum deposit of £20, but the maximum deposit of £5,000 is large enough to accommodate almost all players. With speed of transaction an increasing concern for online gamers, Highroller has managed to streamline its payment processes. E-wallet transactions are generally completed within 24 hours, while card transactions go through within two to three business days. As you would expect for a modern online casino site, there is a strong emphasis on security. The site complies with all the latest data protection regulations and employs industry-standard encryption technology so that your personal and financial details are kept safe. Players will also find that there is plenty of help available. Highroller provides customers with all the information they need within their FAQ’s. Highroller’s customer support are also on hand to assist players with their banking problems. Highroller has developed an impressively responsive customer support service that is available on a 24/7 basis. In keeping with the modern trend in customer services, the company offers a fast, effective live chat facility, and the staff are both responsive and well-trained. For those who prefer other means of contact, there is an email option and a phone number, though the live chat method appears to be the most efficient and doesn’t leave you hanging on waiting for a reply. For those who are used to the familiar online casino, Highroller looks and feels very different. In fact, casino purists may initially be a little disorientated. However, the basics of the Highroller site have the same qualities that make up all great online casino sites: a huge selection of games, generous bonuses and promotions, and excellent banking and customer support options. In addition, Highroller has also managed to tap into the trend for social media, and offers a truly modern combination of exciting, slick gameplay and engaging social interaction. This gives the whole site a refreshing feel, and for newcomers who may be a little daunted by a traditional online casino, Highroller offers a welcoming and fun online venue that will enable you to dip your toe into the world of gaming before you take the plunge and play with real money. There are few better modern casinos out there, and Highroller definitely rates as a must-visit site.